We recently reviewed iENERGY’s Woodgas camp stove for our Biomass Authority readers, and we were very impressed with the product. We subsequently wanted to explore the solar-power option for this stove, and provide some tips for sustainable camping. Even if the Woodgas stove is more of a biomass product than a solar one, it relies on a small electric fan to achieve high burn temperatures, and this fan can be powered by either traditional batteries or solar power. Guess which option we prefer? In case you haven’t read our review of the Woodgas stove, here’s a quick overview: The stove weighs less than 2 lbs. and is built for portability. 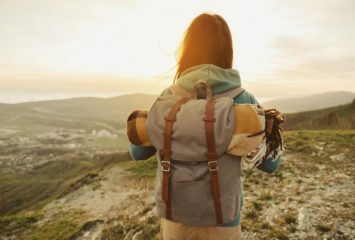 Instead of using white gas or liquid fuel, it uses simple twigs and other organic matter found along a typical hiking trail. The stove functions like a blast furnace, directing air up and through the fire to help it burn hotter and more consistently. It also includes a metal range for resting a pot or pan on, so you can grill up that morning feast or roast marshmallows… your choice! Since the real value of this product is convenience, the solar option is a no-brainer because it has the added advantage of not having to carry around fuel. We put it through a series of tests in Yosemite National Park in California, and were pleased with the results. The solar panel is an add-on third-party device that is sold with the Woodgas stove and includes the correct dongle attachment. It comes with two rechargeable AA batteries; ideally these would be charging as you prepare the stove. Think of it as using solar to charge batteries, which in turn then power the stove. Of course, this means batteries still have to be made and sold with this product, which means it’s not a complete solar solution. For this reason, we chose to test the solar option in survival mode, as if we had no access to batteries. 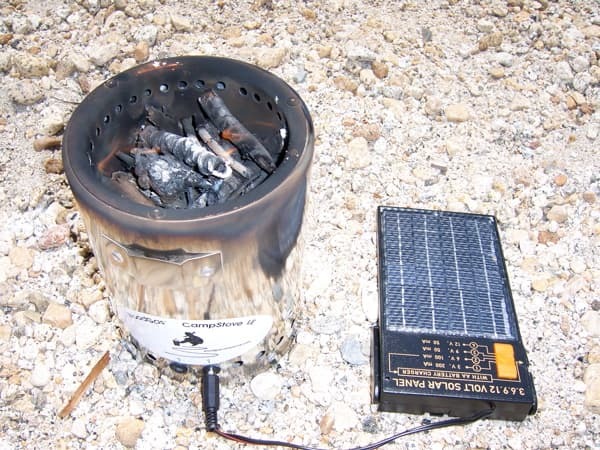 Amazingly, even without the batteries, the solar panel was able to provide power to the Woodgas stove. It did take a few extra seconds to get the fan spinning, and it was a favorably sunny day, but the fact that this little system could run indefinitely just using the sun and a few twigs is truly impressive! With the cost of the stove just under $50, it’s worth checking out. 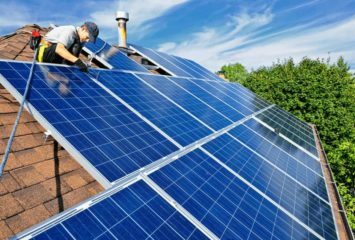 In our opinion, the solar option is a “must have”. Really good idea, but do you have the name of a site where i can buy the woodgas-stove which includes the correct dongle attachment? Also a site where i can purchase the solar panel?